The day began with a film produced by Ryan Dombrowski ’20 featuring himself; Mr. Keith Brown, moderator of Loyola’s Slam Poetry Club and visual arts teacher; and fellow Ramblers Kabelo Muhammad ’19, Kaylle Flores ’19 and Evan Hernandez ’20 performing spoken poetry that introduced the concept for the day. From their classrooms, students then assembled in the West Gym where sophomore Ashley Jablonski introduced the first keynote address. Fr. 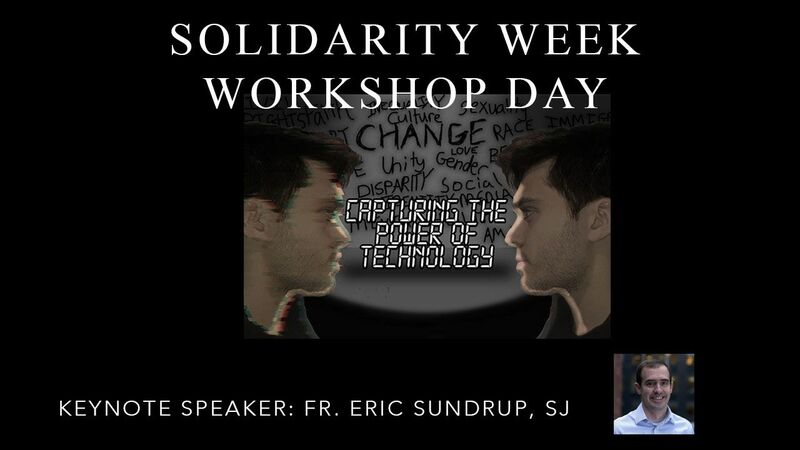 Eric Sundrup, SJ is associate editor and director of audience development at America Media and founder of The Jesuit Post, a website that discusses the intersection of faith and culture for a young adult audience. His presentation focused on the evolution of our interactions with technology, asking students: How is God calling us to use technology? From there, students dispersed to smaller group workshops, which they selected based on a list of discussions and speakers circulated in advance. A wide range of topics included environmental sustainability, immigration, cyberbullying, criminal justice, race, entrepreneurship, bioethics, journalism and mental health. Subtopics allowed for deeper discussion on economics, gender and sexual identity, civil rights, criminal justice and more. Workshops utilized multiple formats such as simulation, discussion, media viewing, performance and collaborative work. Each concluded with a call to action to continue the conversation and activity beyond the day. Several workshop sessions included the presentations of Loyola Academy students in the Ignatian Service Learning Program (ISL), which enables students to learn about social justices issues in academic courses across the curriculum through a blend of community service, reflective exercises and discussions. ISL students presented their research findings and explained their collaboration with partner organizations to their peers. African Clean Stoves. Students learned about problems related to climate change and indoor air pollution in developing countries. Loyola Academy Science Teacher Joe Dahm presented an innovative solution to these problems—clean stoves powered by solar panels that can double as cell phone charging units! Amplifying the Voice of the Immigrant: Teaching & Learning from Adult Migrants. A fast-paced experience, this workshop was jam-packed with student-led presentations. Students learned from upperclassmen in Ignatian Service Learning classes how they can be in better solidarity with those on the margins with something as simple as an iMovie. Nonprofit Videos: Inspiring or Harmful? Molly MacCready, founder and executive director of the Child Restoration Outreach Support Organization, took students through a closer look at how nonprofit organizations utilize media to convey messages about their mission and influence our ability to respect the dignity of others. Jumpstart in the Community: Support for Syrian Refugee Families. Students explored the ways in which we can combat misconceptions of Syrian refugee youth and how we can relate to one another, no matter the previous circumstances we may have faced. Using the information and stories they hear, Leena Zahra, community program coordinator at the Karam Foundation, encouraged students to show they can relate to students their age (Syrian refugees) and how they can be part of a shared community. Are You a Victim of Your Own Devices? Michael J. Weber, partner at Dinsmore & Shohl, LLP and a Loyola parent, discussed the evolving risks that students face with the increased dependence on technology and social media. For a complete listing of the day’s workshops, click here. In addition, the top six documentaries produced by Ignatian Service Learning students to raise awareness for their community partners were screened in the Loyola Academy theater during the “Reel Advocacy” film festival. Audience members voted on the best films, and the winners earned cash prizes benefiting their community partners. Finishing in first place, Samantha Sayre ’19, Bryn Buikema ’19 and Thomas Lindstrom ’19 received $500 for their community partner The Well of Mercy, which provides a secure home in Chicago for single, pregnant women in need. Second place went to Caitlin Walsh ’19, Aidan Koconis-O’Malley ’19, Virginia Hiteshew ’19, Varun Joseph ’19, Claire Goss ’19 and Ellie Slattery ’19, who received $300 for Northside Housing and Supportive Services, a comprehensive human services agency in Ravenswood dedicated to ending and preventing homelessness. Third place was awarded to Brooke O'Neill ’19, Marcus Foy ’19, Jimmy O'Meara ’19, Grace Ritter ’19, Emily Cerimele ’19 and Joyce Matanguihan ’19. Their $200 cash prize will benefit Wilmette’s Our Place, which supports teens and adults with developmental disabilities. The day concluded with a final keynote address introduced by senior Emma Hahn. Dr. Julia Garcia, founder of The Rewrite Project, delivered a raw and energizing presentation that encouraged students to be true to themselves, to rewrite the stigma of mental health and to support one another. To learn more about Loyola Academy’s 2019 Solidarity Project, click here.